What Nuances Differentiate Your Company? B2B marketers are so used to talking about their products that they forget about what makes them unique to specific markets. You've got to get your marketing content refined down to nuances to attract prospects who will become buyers. Because, unless you do this, you sound like every other vendor selling the same product or solution that you sell. Do you want to do battle based on feeds and speeds? Companies can spin numbers to say the same things—or better—than you do. Numbers, usually used without enough context for clarity, are funny that way. Or, do you want to attract attention because your IP (read, expertise) knocks your competitors on their butts? We've gotten to the point that products are a commodity. If nobody else has a product or solution that can compete with yours, you can move on to something else. But really, we all have competitors. To stand apart, to distance yourselves from others, what's your secret sauce? Each and every one of you has it or you wouldn't be in business. So what is it? Distill it down to its core and get it out there with your content. That's what attracts buyers. They want to know why the value you provide is different—and better—than what anyone else they may consider will provide. If you sound the same as everyone else, you're done. So, what are the nuances you can claim? It doesn't take much more than that. Focus on the nuances. Get specific, aim for those target audiences whose business results you can change. I hear a lot that "we don't want to leave ourselves out." Get over it. Right now. Focus on your expertise. Share it. Help people think about what it means, how it can impact them—professionally and personally. With everything else under consideration, that's the draw. Create a plan for how you evolve that story over time. Share it with the specific target market you can transform. If you do this, do you know what will happen? Others will reach out and say, "Hey, can you do this for me?" And isn't that just where you want to be? 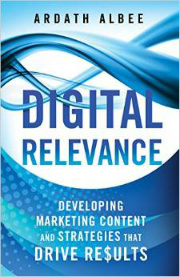 As a totally self-promtional plug, my book - eMarketing Strategies for the Complex Sale - talks about this topic in depth. I had the pleasure of speaking with the folks at Constant Contact last week about their new Event Marketing tool. It sounded pretty cool. So I tried to push them about how it could be useful to mid-size and larger companies whose marketers get stuck in the IT queue, waiting for their stuff to get posted. The timeline is horrific. I pushed about customized templates, about integration, about a lot of ideas that occurred to me. You know what they told me? That's not our market. They then went on to share with me just how well they know who they are and who they serve. "Constant Contact helps small businesses and organizations grow customer relationships and succeed by delivering professional, easy-to-use online services and coaching at a reasonable cost." Because they stick to their guns, they successfully serve over 300,000 customers. And they do it by helping their customers (most with less than 10 employees) have access to professional tools and coaching that helps them look professional and be more successful without investing a lot of time. They know their customers really well. Then they gave me a demo of their new Event Management tool (launched today) and I was suitably impressed. They've obviously put a lot of time into making it as "click and go" as they can. The interface is slick and the process intuitive. And the integration with PayPal makes it easy to launch paid-attendance events. They told me that they do so well because they solicit feedback from their customers and then actually listen to it to drive product innovation. I know - refreshing, huh! So, why add Event Management to their already successful Email Marketing and Online Survey offerings? Because they learned that, "66% of their customers hold 6 events or more a year, with an average of 20 - 100 attendees at each event." That's a pretty good reason. Built in demand from people they already have a high level of credibility with and loyalty from! I'd say that's exactly on target for their market. I write a lot about the need for segmentation and for knowing your buyers as intimately as possible. What I usually hear is "we're okay with just using demographics" or that it's too hard to do more than that. But, just look at what happens when it's not. Go ask yourself if you've got your stake firmly planted in the ground when it comes to not just defining your markets, but knowing them. I wish the best of luck to Constant Contact with their new product. I can't wait to see what they come up with next! Oh, and if you're in need of some cool tools as an SMB, go check them out. Is Your Marketing Content Ready for Step Backs? As B2B marketers of complex sales gain traction in developing content across buying stages, they've got to remember that answering objections and correcting reversals is not just a sales activity. With sales conversations pushed farther back in the buying process, you can lose prospects before they ever speak with your sales reps if you don't remove any doubts that arise for them along the way. Step Backs cause stalls to pipeline momentum. They tend to happen when your prospects have determined your company has a viable solution to their problem, but something pops up that causes hesitation. This can be a competitor's claim, a new ripple effect your prospect has uncovered that the solution will impact or something they've heard from a colleague or peer. There are a ton of things that can happen to cause hesitation. Obviously, you can only address Step Backs if you learn what causes them to happen. I've seen a number of questions asked on social networks lately about solutions. Someone posts a question asking for recommendations for a type of solution or what they should know about a specific solution before they choose to buy it or even why one solution might be better than another. The amount of information being shared is extensive—some factual, but much that's based on opinion more than fact. Nevertheless, what's being said about your solutions on social networks needs to be listened to and, sometimes, responded to. What marketers may struggle with is even admitting there are concerns about buying a type of product. They seem to have trouble talking about anything that's not evangelizing their products. Even though we all know that complex purchases are evaluated based on risk assessment as well as benefits. That's a part of the process. So, meet it head-on and be authentic while you're doing it. I'm not talking about writing a piece about why buyers have chosen not to buy your solution. I'm talking about addressing concerns directly. For example; if your sales reps are reporting that you're losing deals because a certain type of influencer isn't buying in, find out why and develop content to address that concern to help eliminate that obstacle. A prospect has been engaged by all your nurturing touches for the past five months and suddenly ceases to click through. Take a look at the prospect's individual profile and see if they've returned to some previously viewed content. If so, perhaps something in that content hasn't fully answered their needs and they've gone back to look for reassurance that their assumptions are correct. This is the perfect time to reach out to them personally and ask if they're looking for specific information you can provide. Most marketing automation solutions have a rules or work flow process that allows you to automatically send a message if your prospects do or don't do something. If you uncover certain patterns of behavior, you can develop content and distribution processes to address Step Backs as they occur, keeping prospects moving forward. Or it could be that their priorities changed. You won't know until you ask. There's never a cut-and-dried rule for prospect behavior, but there are ways to try to address it helpfully. Addressing Step Backs with content is a proactive way to show the depth of your understanding about your buyers' needs. By engaging with them about concerns that cause hesitation, you gain the ability to get them moving forward again, rather than losing them to a competitor or even to a decision to do nothing. In response to the blog post I wrote about the Return on YES, I was asked on Twitter to give some examples of what I mean by "show your prospects the next steps." Think for a moment about the user experience at your website. You plan for how you'll get your website visitors to click on something to learn more after they arrive - to dive deeper into your content. You construct navigational paths designed to lead them to the information they need (at least I hope you do). This means that once they click on something and move to that web page, you provide what you promised and then offer other related choices. And on, and on. If all you ever wanted was for them to visit your homepage, none of this would be necessary. All of us would have single-page websites that read like executive summaries. Boring, right? Helpful, not so much. Think about your content from this perspective. Do you only want your prospects to read that one piece of marketing content? Of course not. In a complex sale, that won't get you very far. Educate prospects about an issue that could be an obstacle to achieving an objective. Offer evidence that solving the problem delivers tangible outcomes. 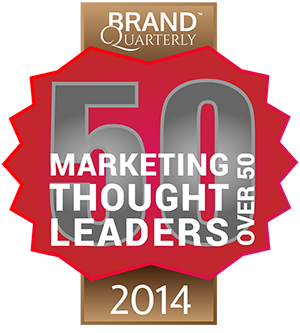 Provide thought leadership about an industry trend. The examples can go on for miles, but you get the idea. So let's take the first one and dive in. Once your prospect has read an educational piece to learn about why they might not be achieving an objective they want, is that the end? Nope. You've left them hanging. If you were them, what would you want to know next? What are others doing about this? If I solve it, what will happen? How hard is it going to be to solve? Prove that you can fix it. What will I have to risk to do so? There are a multitude of thoughts and questions that occur to people after they've learned something relevant to them. To show your prospects the next step means to answer the questions that the content they've just read may have provoked. This is why I continuously talk about content strategy, editorial calendars, storylines, buyer personas and problem-to-solution scenarios. Showing your prospects the next steps doesn't just happen by accident. It takes planning. It was pointed out to me the other day that no matter how I think a prospect will work through answering all their questions, they'll do it however it works for them. This is a valid point - the way people think is not as predictable as we'd like. The crux is that if you don't plan for and develop content to show next steps, you won't have it available for whenever the time comes to provide an answer they're seeking. The other factor is that if you develop your content to continuously evolve the concepts and ideas you're sharing in a progressive manner, you have a better shot at keeping your prospects engaged with your story. And that level of engagement is what will eventually cause them to raise their hands and reach out to get more answers - the ones they need right now that they expect you to have. And that's exactly what you want them to do. Most B2B companies have lots of content for late-stage buyers. This includes data sheets, solution briefs, technical white papers, online demos, etc. If you evaluate your website content, you’ll likely see most of your content oriented around your product offerings and solutions. The gap I see most often is a lack of early stage content that develops a relationship from the start of the buying process and primes your prospects for that later-stage interest. B2B buyers of complex solutions need a lot of education before product-oriented content is useful to them. Early stage content is not about your product. Your company is the only entity that truly cares about your product. What people care about is what your product enables them to achieve. But, at the early stage, prospects don’t even care about that. Whatever their situation, they’re dealing with it. It may not be ideal, but it hasn’t stopped them in their tracks, so it’s sufficient. This means that we need to reach farther back from what our product enables people to achieve in order to create content relevant enough to gain the attention of early stage leads. Before you can talk to them about change, you’ve got to show them you understand their current circumstances. What situation(s) cause people to want to achieve the outcome your products deliver? What caused that situation to exist in the first place? What circumstances made the situation so untenable that it motivated your customers to take action to change it? The answers to those questions should point you toward the subject matter for content development. Think of it as meeting on common ground. When you address the situation your prospects are living with everyday, they can instantly relate. They’ll look farther to see what else they may not know about their situation. They’ll engage with your content because they can see themselves in the storyline. Beyond that, by creating early stage content, you gain credibility. You show your prospects that you understand their business, roles and responsibilities, as well as how difficult it can be to figure out how to go about changing their situation—or even why they should. Considering that prospects are demanding that companies they choose to partner with come to the table prepared, you’re already showing them the depth of knowledge and consideration your company extends to customers. With longer buying cycles, it’s critical that marketers position their companies to become the anchor prospects seek out to help form their thinking about their situations—and the possibilities for change—by starting from common ground. When you can engage at this level, prospects will take next steps with you to move forward. This means you need a progressive content strategy for how you’ll motivate them to take action. By starting with a focus on status quo, you’ll have a solid foundation on which to build it. Lead nurturing has been proven to be instrumental in producing qualified sales opportunities for B2B organizations—when done well. The goal, of course, is for your content strategy to produce momentum during the buying process that consistently produces that outcome. But I'd like to challenge you to go farther. You've got to harness the returns on YES to help your prospects take each and every consecutive step with your company. Every time a prospect responds to you is not a YES. Here's what I mean. If YES is defined as not only getting your prospect to open the email, click through to the content and then click to read the next related piece of content in your storyline, they have to do all three to give you a YES. If they only make it as far as open, that's a "maybe." If they make it past open and follow the link to your content, that's an "okay." But, until they click on that next link, you don't have YES. You see, the email send is only an initial invitation. In a considered sale, your prospect has so much to learn that if he's only reading that one piece of content you send out attached to your nurturing email each month—well, it will take forever to get to YES. Eventually, as you help your buyer traverse the steps of learning all they need to know to be willing to engage in a sales conversation, the definition of YES will become that sales conversation. YES is progressive. YES is based on credibility and value perception by your prospects. YES takes patience, consistency and relevance. YES requires that you show your prospects the next steps. Without a continuous string of YES in response to your nurturing programs, how far do you think you'll get? That's why you need a content strategy. It's not just about "what do we send next?" Nurturing is about knowing and planning for how we respond when we get a YES. Interactive marketing means your nurturing program is a two-way street. If your response doesn't acknowledge their YES, you're not likely to keep getting that level of engagement. How are you incorporating YES into your nurturing programs? Better yet, how are you leveraging the return when you get YES? Something to think about. There's a terrific, provocative and challenging book on the stands today — Dirty Little Secrets: Why buyers can't buy and sellers can't sell and what you can do about it. Sharon Drew Morgen's book unveils what lies beneath the buying decision process, layer by layer, until you finally get that Eureka moment that it's got nothing to do with the product. We, as marketers and sellers, focus on identifying triggering events, needs or problems and begin addressing those as a way to build relationships and get our prospects to buy from us. As I was reading her book, I realized that we're actually a bit late to the party and trying to sneak in through a side door. In Dirty Little Secrets, Sharon Drew shares a wealth of examples to help us understand what goes on behind the scenes. She puts clarity around status quo by showing that all "systems" have workarounds in place that keep things functioning, even if not optimally. Untangling those workarounds is often the barrier to making a sale. "No decision to purchase will take place unless the people and policies included in the workarounds buy in to change and the elements are redistributed in a way the system approves." The key is to help buyers manage their offline change issues prior to our attempts to focus them on solving the problem. When we don't do this, or our buyers can't do it on their own, the decision made is to do nothing at all. The system wins the battle to maintain status quo. Sharon Drew points out that the issue is often that buyers have tunnel vision when it comes to dealing with issues. They're simply too close to them to see the entire spectrum they must address to get true resolution. Our job as marketers and sellers is to help them step back and take an objective stance that enables them to see the entirety of everything involved in solving the problem. Dirty Little Secrets is all about showing you how to "facilitate the route through to the buy in process." Sharon Drew does a magnificent job of making this easy to understand. In fact, when I read it myself, I had a V-8, head-slapping moment. I believe a lot of us know this subject matter subconsciously, but I've never had a better way to articulate it and get to the root before I read Sharon Drew's book. And, in case you think this is just a sales book, I warn you - the insights can help marketers who are earnestly trying to map content to buying stages reach even farther back to engage prospects earlier in the process in a more productive way. If you do so by October 29th, you'll also get a slew of great gifts. 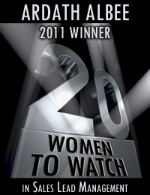 I was recently interviewed by AllBusiness.com about the idea of Handicapping Target Markets. Handicapping in this sense is about how to use personas to increase the relevance of your nurturing campaigns to cull more ideal customers from your pipeline—as well as shorten sales cycles. Characteristics - the traits like roles, responsibilities and influencers that dictate your buyers' behavior and what they need to build a business case to buy. Handicapping as a group process involving salespeople and customers. What kinds of questions you need to answer from the buyers' perspective to create content with higher relevance. 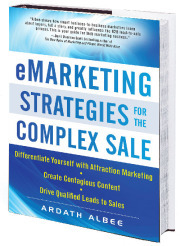 I also delve into this subject extensively in my new book, eMarketing Strategies for the Complex Sale. I present the idea of extending the persona into the creation of buyer synopses, which is essentially the combination of personas with a targeted problem-to-solution scenario. The outcome of this work is producing the insights that help marketers develop highly relevant content for progressive nurturing programs. You can also download two chapters of the book here. One of the things that's very cool about content marketing is that there are so many different kinds of content to create. You've got white papers, eBooks, customer success stories, how-to guides, videos, podcasts, Tweets, blog posts...and more. What I fail to understand is why the article gets so few kudos. Research reports on collateral use focus on white papers, solution briefs, data sheets, video and case studies. No mention of the article. Content articles should be a staple in B2B marketing programs. An article of 750 to 800 words allows marketers to focus on one aspect of a problem-to-solution scenario. They only ask for a few minutes of your prospects' attention at a time, but can leave valuable takeaways that build momentum across the buying process. A series of articles enables you to tell a "story" over time. Each one can build on the last, creating more credibility for your company with every "touch." With sales cycles lengthening we all need to build more trust over the long haul, right? There's a lot of talk about the difficulty of producing the volume of content needed to keep meat on the bones of nurturing programs. Articles can help. A white paper provides one touch for your nurturing database. It may do a great job of generating leads for months, but in the nurturing sense it's one touch. However, consider that you can likely extract 5 good articles from a solid white paper. Articles are more likely to get read because they require less effort and time commitment than a white paper. Think about the last time you downloaded a white paper. Did you actually have time to read it from beginning to end, or did you skim it and save it thinking you'll go back to it later? If so, did you ever go finish reading it? 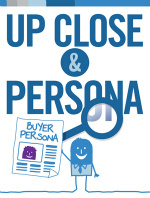 The limited topic focus of a well written article allows you to pinpoint prospects' interests. Articles provide lead-ins for follow-on conversations based on something specific and relevant to your prospects. The fact that they probably read them helps. Articles pull prospects farther into a relationship with your company by doling out valuable information a bit at a time. Your company's credibility increases with each relevant article your prospects experience. Articles take less resources to produce than many other types of content. Articles provide a continuous source of fresh content for your website, giving your prospects more reasons to return and spend time with your company online. When it's critical to keep the attention of your prospects over the course of a lengthening buying process, give articles a chance. I think you'll be pleasantly surprised by the response, the insights and the growing level of engagement your content marketing will produce. Rounding out the week with my final post on SAVO Group's wonderfully inspiring Summit in Chicago. Jeff Summers, COO of SAVO Group, shared their vision for sales enablement. I have to say that every single SAVO employee I met (and there were a lot of them) was engaging and passionate about what's being accomplished today, and what's coming down the pike. Top salespeople are trying to connect everyday. They contribute and leverage the contributions of others. What companies need to realize is that salespeople contribute in different ways. Determine which capabilities are relevant and roll them up for integrated delivery out of the box. Use the tools that enable you to control and govern those capabilities in step with your company's culture. Companies who are rigid will use the toolsets differently than companies who are open, for example. The ability to change and evolve in step with needs. People don't talk about adopting Facebook, they talk about addiction. Addiction is to information that the technology provided, not the technology. Key point! The goal for companies is to get your salespeople addicted to your information. This makes total sense, but companies are still struggling to produce and provide content and information relevant to real-world situations. From another perspective, consider that your top reps are too busy to purposely contribute. This said, they ask for stuff all the time, they rate stuff and they use stuff. Based on what they ask for, how they rate things and what they use, companies can get a clear idea of what they need by looking at those metrics, plus what they search for within the platform. Asking questions is one key way to gather Tribal Knowledge - for every question a sales rep puts in the system, they get an auto response that tells them you're working on it. When the assigned subject matter expert answers, that answer is connected to the question within the platform. Even if the answer is sent directly to the rep through email. This way, the system becomes a holistic source for the information sales reps really need to engage in effective dialogue with buyers. And subject matter reps aren't pestered to answer the same questions repeatedly. Questions drive participation and your content and insights transition that particiaption to the market. I'd like to share a little story that Carla from SAVO told me during a demo. One client had a dismal 30% satisfaction rate by their salespeople on their sales portal content. They launched the platform and migrated that same content into it (due to time constraints). You'd think that the launch would be a dismal failure, right? Exactly the opposite happened. Because they could display the content for contextual presentation and tag it so salespeople could find just what they needed, their satisfaction rating skyrocketed to 70%. Now, that should give you some food for thought.